I know this City from that TV Series! and nothing is going right. We; Victor, Robert, Pepen and me; ride 4 hrs to Kuningan to attend Chery's wedding. He was Victor's and my highschool classmate, and also in the same faculty with four of us. It was traditional wedding, with lots of rituals, too many nice pictures to put on...but these pictures will tell you more stories. 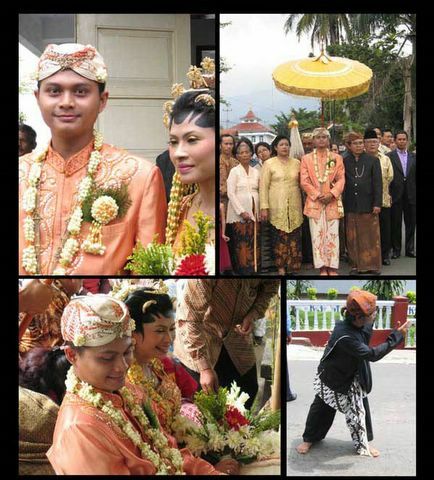 below were 'injek telor', metaphors of good marriage, to serve [each other]. Chery was abit ill. But see how big the bride's smile! Groom's jasmine necklace for Pepen; wishing him to get a girlfriend soon. 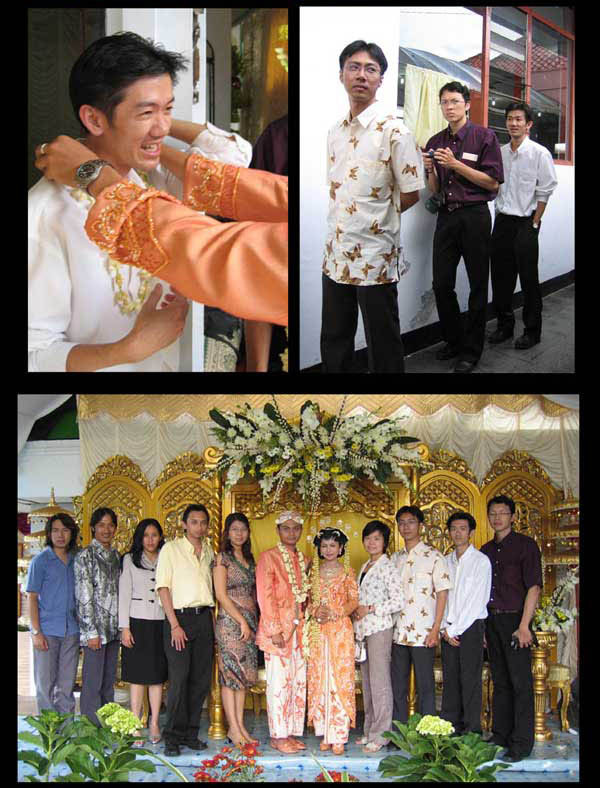 And here we are...just few friends that had chance to attend this superb wedding. 9 hrs driving from Bandung to Jakarta. Siapa suruh datang Jakarta, I sang along. My appointment was supposed to be in the morning, 9:30. Rescheduled to 5:00 PM. Lucky enough I wasn't trapped in flooded area, in general, traffic in the city was much milder than what I experienced from Bandung to Jakarta...or may I say...around 15km to Jakarta? It wasn’t a good night sleep. My phone rang on 6:30 AM. Hello, did I wake you up? Ach, it’s Mom…as usual, she is my morning call. Anyway, I was half awake already—or even haven’t slept, maybe? Yesterday, Mega—my cousin, she is a year younger than me—was proposed. Ugh..where was your conversation leading to, Mom? I never keen to talk much about my cousin’s life. Did some exercise, I was ready to work. Got it washed thoroughly, too. It should be ready for my first time driving to Jakarta from Bandung alone, tomorrow. also list of work for Dimas. Went home, reading sphinxku blogs…seeing her soaking in bathtub really make me envy! I promised my self, next time I build my ownhouse, it should be with bathtub installed. So difficult to wake up today. Went to church at Pandu, it’s been a long time not having service at this church. It’s in the neighbourhood of Victor’s childhood home. After service, we bought Ambokueh for breakfast. Completely a lazy day, I was lying in front of TV, switching between channels. Having lunch at Pizza Hut, strolled for awhile at BSM. Afterwards, stopped over at office, we did some cleaning. O yes! We don’t have office boy, so we are owner plus…cleaning service. Then here I am, updating my blog. Soon I’ll off to bed, or maybe read abit of ‘Orang-orang Bloomington’ by Budi Darma. I’ve set my alarm at 5:30 AM. It’s my Mom’s birthday. I called her, she sounded happy. Her café is in a local newspaper, one page news, entitled “Kafe Mama Utamakan Makanan Sehat” [Mama Café: Healthy Food as Priority]. The news is a blessing for her café. Daily income was increased significantly. Good, I’m happy for you Mom! I fell asleep again, then I heard Susan came in, I woke up. Went out, greeted Eka—as I promised—and took shower. Susan was preparing breakfast and snacks for our trip to Bandung. Susan was going to attend her friend’s wedding, while Susi and Eka returning home. Around 09:30, Susi’s back from her office family day. 10:30 something, we left for Bandung, in general traffic was good. 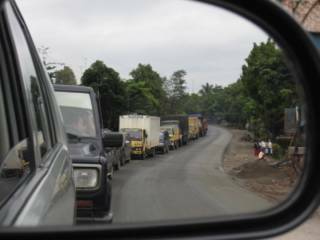 Just some queue at highway construction area in Purwakarta and Plered. 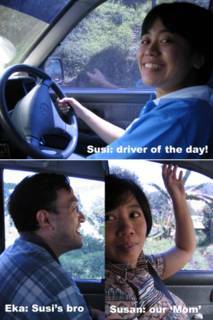 Reached Bandung around 02:30 PM, they drove me to office. Everyone was still there, except Robert. I wasn’t in the mood for working, it’s end of day and it’s Saturday! At night, Victor and me went for Black Coffee Bar, he’s promised to bring me there. It’s a nice place…just a little bit noisy. Susan called, they just left the party, and asked us where to meet. Up to you, I said. It’s weekend, it’s easier for my Visto to look for parking then their big car. Thus, we went for Serabi Imut at Setiabudhi. Man, the place was fully packed. Our orders were served 40 minutes after! Then, we say goodbye and see you later. Victor was still hungry, we stopped at hawker near my house, for a seafood. I didn’t eat anything…too full. Suddenly, a half drunk junkie came to our table, asking for ‘donation for Aceh’ saying things like ‘our friends are in sorrow, you should do something, give some money’. DAMN!!!! I couldn’t say a thing…I still can smell his alcoholic breath. Then I went home, sleep…still thinking of that junkie, and maybe even hundreds or thousands people like that taking advantage on others’ grief. As planned, I left Bandung for Jakarta at 7:30 AM, by train. Looking for my seat, I found I sat with a lady, long black hair and looks mobile. Haven’t got my morning caffeine, thus I ordered black-coffee. I asked to make sure, that they wouldn’t put any sugar in my coffee—I just don’t like black coffee with sugar. When my coffee came, the meal that lady ordered was served as well. Suddenly she asked me why I bothered to ask coffee without sugar—then I know she was in Germany for quiet a time, since she had that habit too: black coffee no sugar. Ok..well, I was in Netherlands for 2 years, I explained, but since before I’ve loved my coffee without sugar, unless it’s cappuccino or iced coffee; yet I’m not used to order them. Who knows black coffee no sugar could keep us talked until we reached our Gambir? And what fascinating is she was a closed friend of Pak Daud Minwari, a teacher of mine in university, and a good friend of Victor’s Dad. Reached Gambir at exactly 10:15, Ce Nat was there with Vivienne. My cute niece had never seen train. Captivated, she kept asking her mom, and later her dad, to take her go by train…Believe me, it’s not easy to keep her away—even for awhile—when she is fascinated by something. Around 11:00, Ce Nat drove me to Bina Musika at Kyai Tapa. Andrea called me to meet him there. It’s a music school owned by this attractive lady, Neneng. Later on I knew for Andrea that she is around 40 something!!! Her appearance really deceived me, what an gorgeous woman. I was chit chatting with Andrea for a while, it’s been long since I left Delft. Then 12:30 PM we left for an appointment with Kandi at Taman Anggrek. What surprised me to meet Andri over there too. I thought he was still in Hong Kong. Oh.. He is a friend I know from Andrea and Sari, one of their closed friends in Leuven-Belgium. But it’s worthed. The discussion was an enlightment. We made scheduled to meet again this coming Wednesday…that means I will go again to Jakarta! Andrea had appointment with Neneng at Chianti Resto at Mega Kuningan. I just joined him. Oh btw, he gave me a bottle of Torres, my favorite Spanish red wine. He also brought the last piece of Urban Question copy Sari has made for me…thanks darling! Hence, I got some chance to talk for awhile with this lady. She is fun, has so many to talk about. Makes people easy to involve in the conversation. She is also the owner of that Chianti Resto. I ordered Mint Tea, and she ordered Tortilla for us. Frankly, I was completely full when I reached there. I’ve promised to stay overnight at Susan’s place, in Kelapa Gading. So after emptied my cup, finished my tortilla, I excused myself. Neneng had arranged taxi for me—what a compliment!—after several bye bye and cheek to cheek kisses, off I went to Kelapa Gading. It was Friday, and rush hour, so it’s expected traffic jam. Was ok, I put my most confidence look—as if I know the way to that place—to ease my mind from all that freaky stories about taxi in Jakarta. Then after around 45 minutes—it was quick!—I reached Susan’s house. Susi was there too, companying Susan while Susilo—Susan’s husband—was in other town. We had a lo~ng talk just like before, from work, life, stupid incidents, food, illness, our mutual friends, etc etc. 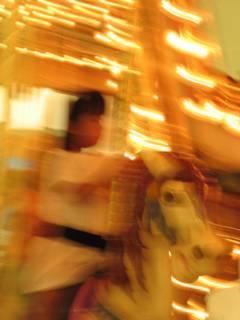 Later we moved from living room to Susan’s room, while waiting for Eka, Susi’s brother—why then this blog sounds complicated?—around midnight, her mobile rang, it was her brother, outside the house. He was just back from meeting old friends. I was in my pj so I refused to go out and greet him, I just waved to him when Susan opened the door. ‘Tomorrow morning, I greet you properly~’ I said jokingly. I checked my mobile, was sending several SMS to Sari, asking for her condition, and answering my Mom’s SMS. After short talked with Susan, I was lost in the conversation…as usual, fell asleep. Went to office early in the morning, as usual, but have no passion to work. Yet, need to prepare something for Dimas to work on. Back home for lunch, I got a card in my mailbox. Poststamp: Mannheim, card with Heidelberg picture. From the handwriting, it must be Wolfgang. es ist wirklich schön, danke! "...on this card, you can see where I live, it's in the middle of the right piece"
Then in the afternoon, went to get my train ticket. tomorrow will go for Jakarta, have appointment with Andrea, now...I hope there's no more changes. 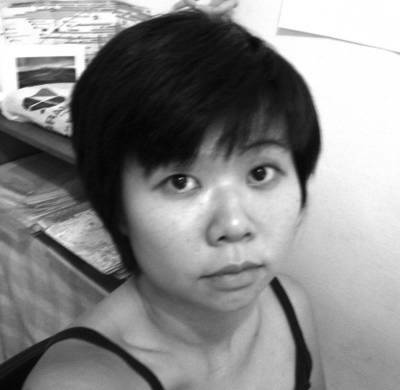 new hair cut, I love it, short and simple...help me to stay away from blow-dryer. passed by Kriste, a bakery, picked up some stuffed bread for breakfast. How I wish that I won't do the same thing as Mathieu has done in that story. Day passed faster then before, maybe loads of work pushed it faster. Dimas--the new employee--works really well, so does Achie. She will be graduated tomorrow. I'm glad--so far--having them in our office. Having dinner at Sop Kaki Sapi, then I drove back home. Uploaded some forgotten pictures to http://ycapungonpics.blogspot.com/ before chose some of them to animate my blogs. It's been few days rushing to office every morning. There is new employee since Monday, his name is Dimas. Helping me now with the Samarinda project. trying so hard to keep awake with controlled emotion. am allermeisten...gut vom Glück mit Ihren Prüfungen! After two days curbed in bed, I feel alive again today. Woke up felt abit better, I chose to be ready for the day. Went to office, on the way I was still dizzy…but whatever. Morning was bit hard for me…computer screen seems too bright. And now I’m in my prime condition again!!! Calling Pepper around midnight, it's her birthday. Haven't talked to her since the last time she missed her flight to London, and left my door at Roland Holstlaan 209, after saying goodbye to me. Second day in the bed. But this morning I manage to go for work, at least till lunch time. 45 minutes bus from airport to train station, Gambir. 3,5 hrs by train to Bandung. which finally I arrived around 6:00 PM. until a phone call came. the birthday girl had blister...dinner was cancelled..
woof...frankly, I was thankful...oh, not for the blister..ppplleeaasssee...but for the cancelation. thus, we went for a relax dinner [uhm..new year dinner...we said] at 'Rumah Nenek' resto..
went back home, completely exhausted I plunged on my bed. several miscommunication started the day, terrible..but we managed. feel a bit dizzy, I hope I won't catch cold. It's the last day of my stay in Makassar. Tomorrow my flight will be at 10:55. I bought some coffee for office in Bandung; Oky and Nani asked some, too. since everytime I went back from Makassar, my stuff is always doubled. too bad in computer here I don't install Hello! so no picture for now. Ugh...vacation is almost ended...heading working days ahead. Goodie, after long rest, I think it's time to heat up again. uh oh...just remembered...Tante Dien asked for gogos...hmmm..should find way to pack them in as well! Today is receiving email from old friends day. I was wondering how she was doing, and voila...her email popped in. She sounds fine, i'm glad to hear that. nanti balesnya pas udah di bandung ye..! well, no news means good news. wish them well within this new year. life is rolling...giving new chances to play within.